The BOSS KATANA Mini Guitar Amplifier Combo packs incredible power into a compact unit that can be taken anywhere you go. Whether you're practising backstage before a gig, jamming with friends, or chilling in the park, the KATANA Mini is the perfect choice. With a durable carrying handle on top, simply pick up, find your spot, plug in your guitar, and get shredding! Don't be fooled into thinking the KATANA Mini couldn't knock you off your feet. The diminuitive battery-powered amp packs a mighty, full-bodied tone that makes you want to get stuck into some serious playing. Boasting a custom speaker, advanced hardware, refined circuitry, and select component selection, everything comes together to produce something very special. Whether you're using the optional power supply (sold separately), or six AA-batteries to give you the juice needed, wait to be blown away by this little dynamo. Equipped with all-analogue input circuitry, the KATANA Mini includes multiple gain stages that drive three classic sound settings, much in the same way you would find in certain boutique amp designs. When you give this little beauty a push, you are rewarded with an expressive tone that is the stuff of dreams. The distortion can be tempered using the input volume and pick attack for a dynamic response. Inspired by BOSS’ flagship Waza amp, the Katana-Mini’s Brown setting bursts forth with rich high-gain tones that are infused with complex harmonics, ideal for chugging riffs and searing leads. Crunch provides overdrive that’s ideal for thick bluesy leads, while Clean polishes up nicely with sparkling tones that shine. The Katana-Mini is home to a three-band analogue tone stack, which offers natural tone sculpting via familiar bass, mid, and treble controls - just as you would see on a full-size amp. Whether you want to create that classic midrange scoop sound, go for a more bottom-heavy approach, or make everything wail, the knob layout gives you complete tactile control. Enhance your tone using the onboard tape-style delay, with dedicated time and level knobs. Whether you want to create a subtle slapback effect, long, warm delay repeats, simply attenuate the controls to find your sweet spot and you're all set. 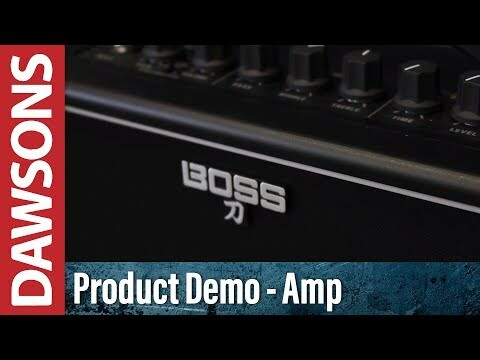 The BOSS KATANA Mini Guitar Amplifier Combo can never be described as a one-trick pony. It is compact yet loud, has three distinctive settings with a three-tier tone stack, AND is great for practising, jamming, and even recording. The headphones jack allows you to practise in silence wherever you are. However, it also doubles as a recording output with cabinet voicing, so that you can connect to your DAW of choice via an audio interface to track and record your licks and riffs. The aux input also allows you to plug in your smartphone or other external sound source to playback your favourite tracks and jam along with them. The BOSS KATANA Mini Guitar Amplifier Combo is everything hard rock and metaller's have been wanting in their dressing room to warm up with. It is great for recording sublime tones on the road. Plus, it looks awesome too. Posted on 19/12/2017 by Derek Great value and every bit as good as the best reviews. All sounds are spot on and more than loud enough as well as low volume. Any pedal adaptor should work.